Slowly being engulfed by cranes and car parks, Melbourne's dockside ARI stops serving up art at The Food Court. 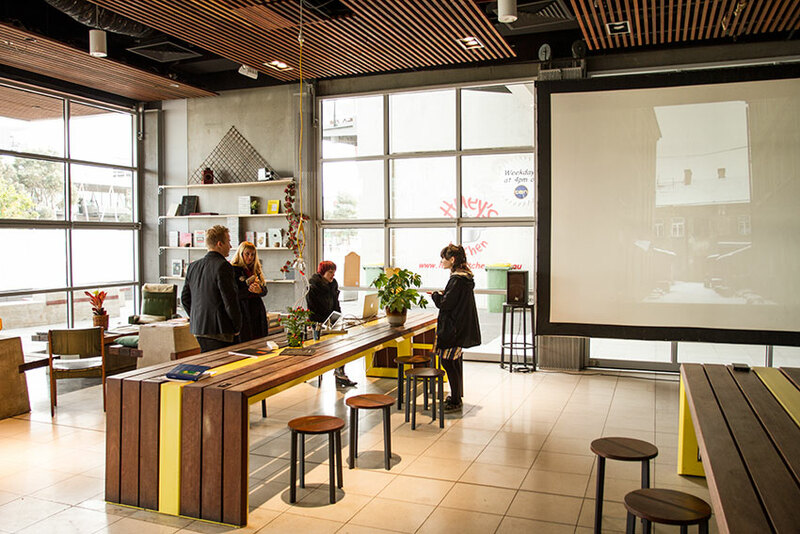 Occupying an abandoned food court within the Waterfront City complex at Melbourne’s Docklands, the project came about when Marcus Westbury called for artists to activate the area. It was a model that he had made successful with the Renew Newcastle project, which gave disused city spaces to artist and creatives. The Food Court has survived with a month-to- month rental agreement for the past three years, however at the end of June; it will close its doors to the sound of building works that surround it. ‘We are one of the last spaces left – there were about 14,’ said co-founder Amie Anderson. With seating for over one hundred people, the Festival Food Court lay abandoned for two years after closing its doors in 2010. A group of artists decided to crowd fund to turn it into an experimental space for emerging and established artists - part gallery, part residency and part social space. And with a mere $5,500 raised through a Pozible Campaign, The Food Court ARI was born. Anderson said: ‘I never really meant to take it on - it was not my vision to run an ARI- but people just kept dropping off over time.’ Anderson has run the space with Nico Reddaway over the past three years, and has been intermittently supported by a small team of artists, all contributing to the life of The Food Court. She continued: ‘A lot of things I would have done differently. I would have liked to have had a more official board in place to help to bring on people with particular management skills, but people want to give time and energy into something that will grow and is more long term. ‘We could never give that confirmation. There was always the threat of being kicked out each month,’ she continued. ‘But, we didn’t have to worry about things that ARIs in the city do – they have higher rent, get more funding and have boards and therefore are more responsible to more people and organizations. We had more freedom; financially and flexibility wise, we could give artists a space to experiment in that other ARIs couldn’t. Some artists could be working on a show, in the space, for weeks before opening, where as in other spaces they might only have one or two days. This project was always going to have an expiry date. It comes with the territory of using buildings caught in stasis between former glory and pregnant with their new future. ‘It’s pretty crazy actually – there is development all around us,’ said Anderson with a laugh. ‘But I don’t think this part of Docklands will host artists again,’ she lamented. The Food Court has had a great relationship with the City of Melbourne and Places Victoria, who subsidise their rent. With just $20 rent on the space to pay weekly, that meant artists could be in residence for free and exhibit for a very low fee. Anderson explained that the ARI hired out the venue for private events to subside the running costs – electricity, Wi-Fi and installation materials. ‘Hiring the space out occasionally kept us going and put money back into the space. It was also great as it invited the general public also into the space,’ said Anderson, adding that it was especially important today to find alternative ways of doing projects – making them happen. She continued: ‘It is very important for small organisations and emerging artists to use whatever space they can and to be creative about it - it forces you to think differently about how you make work – to consider the space its history and its future. ‘We have had so many artists come through The Food Court with great ideas, but many of them just haven’t been able to fund them. ‘We are really grateful for our time here and that we could use the space in that way,’ she concluded on behalf of the founders and team of artists behind The Food Court. The Food Court closing party takes place on 28 May 2016 featuring local musicians and artists. It is located at 427 Docklands Drive, Docklands. © 2019 The Food Court. All rights reserved.